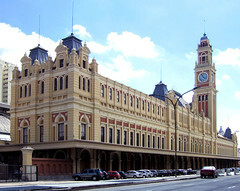 Luz Station in Sao Paulo. Looks externally very similar to Melbourne’s Flinders Street Station, well if you don’t look too closely. Coincidence, or is one modelled on the other? Probably the former. I haven’t seen anything that suggests Luz has something similar to the front of FSS. (More pictures). Thirteen Tonne Theory, Mark Seymour — the story of Hunters and Collectors. Very well written and very funny in parts, for instance the mentions of Boston’s “More Than A Feeling” having the same riff to “Holy Grail”. And interesting too if you’re familiar with the music and want to know the story behind it. (Reviews: Age, ABC). American Journeys, Don Watson — great stuff as Watson tours America by bus, car and train. Some interesting characters he meets, and me being me, I found his commentary on Amtrak particularly interesting, and his dealings with their call centre very amusing. (Age review; Interview with author). I am Masterchef of my domain. Why does the Aveda web site have some bald guy making recommendations on hair products? A while ago I pondered where Doctor John Carnie (Victoria’s Chief Health Officer) is while we’re dealing with a pandemic. Apparently he left to go on holiday just before the crisis blew up. Good timing! If people think literacy is not a problem in Western countries, they should take a look at some of the comments on Youtube. Victoria’s Chief Health Officer is Doctor John Carnie. So I’m wondering… Where is he? I’m sure acting CHO Rosemary Lester is doing a fabbo job, but if the state has a WHO-recognised pandemic on its hands, shouldn’t the actual CHO turn up? Shouldn’t it be all hands on deck?